It’s a busy weekend to say the least, last night we had the opening reception for the collective works of the InkSpots. This is a group of printmakers I belong to in Ventura. This is the second year that the printmakers have created a folio. Eight of the members created their own edition of 10 prints that are part of the 10 porfolios for sale. Eight original pieces of work all ready for framing or to be kept in a beautiful acid free box. You can contact Galley 255 for additional information. We had a great turnout. The show will be on for the rest of the month until the 25th. Hope to see you there. 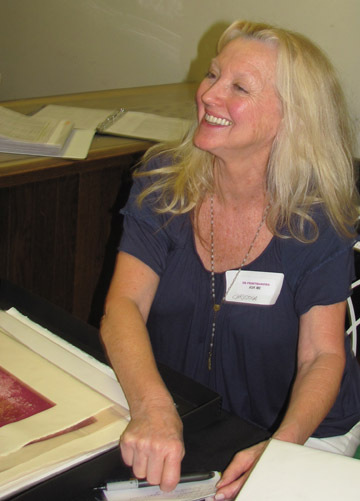 I was thrilled to be juried into the Santa Barbara Printmaker’s Show at the Channing Peake Gallery in Santa Barbara. The juror was Tim Schiffer, the Executive Director of the Ventura County Museum. I had to send him a thank you note for including me in this comprehensive and varied exhibit showcasing so many incredibly gifted printmakers, it was truly an honor. Santa Barbara has First Thursday, when the galleries are open late and often times the artists are present. As an artist, I am always happy to be able to meet with other like minded individuals and hear about their work and their process. This last Thursday, six of us were able to bring our portfolios to the gallery and meet with the gallery visitors. It was a wonderful experience. My Buddha etchings still hold a great deal of interest. Last year my “Peace in Pink” Buddha monotype sold at The Buddha Abides Show at the Frameworks Gallery in Santa Barbara to a woman who has a twin. I found out her twin also wanted one, but as the print was an original and one of one, she had to pick another piece. As I was sitting at my table with my portfolio a woman walked up to me and said “I have your Buddha etching”. It was the other twin! I was thrilled to meet her and visit. Enjoy your Buddha etching Jennifer!